The Pug is an extremely friendly and fun breed of dog to have. It can be very silly while remaining dignified. As a companion, it is very playful yet confident and sure of itself. It may have fits or spurts of being hard-headed, and/or “headstrong” but this is not a constantly common trait. It typically chooses loyalty and loves to please its owners and family. It also tends to be ostentatious at times and loves to show off when there are people around. Like most dog breeds, the pug does require daily exercise. However, this doesn’t have to be extreme physical exertion. Lively and active games typically do the trick or you can take your pug for a moderately paced walk while on a leash. Either should suffice and meet its exercise needs. Because of the many deep wrinkles on its face, it does need a daily facial cleansing in order to keep its wrinkles clean and bacteria free. Its coat consists of short fur that needs brushing from time to time just to remove dead hair. All of its wrinkles need tended to regularly to avoid skin infections. If you hear your Pug wheezing as it sleeps or breathes, this is normal for the breed and shouldn’t alarm you. Two major concerns for the pug include Pug dog encephalitis as well as Chronic Hip Dysplasia, or “CHD.” Minor concerns include an elongated palate, stenotic nares, patellar luxation, Legg-Perthes, entropion, KCS, skin infections, and hemivertebra. Seizures and nerve degeneration are also occasionally seen. The best thing to do to keep your Pug healthy is to make sure you are going to the vet at least yearly for checkups. Pugs have been known by many different names over the years. Some of these names include Mopshond, Mops, Dutch or Chinese Pug, etc. The actual term “pug” is derived from the Latin word “pugnus” which means “Fist.” Many people speculate that this is because the head of a pug looks very similar to a clenched fist. Another theory is that Pugs were named after Pug Monkeys that had a brush with popularity in the 1800s. Pugs apparently look somewhat similar to these Pug Monkeys as well. Basically, the Pug looks as though it falls somewhere between a clenched fist and a monkey. Whatever the Pug resembles can be left up to speculation but there is one common agreement surround this breed, the official motto “Multum in Parvo.” This means, “a lot in a little.” This breed is an exception to the Toy group because of its Mastiff descent. Although it’s ancestry cannot be 100% determined, due to no documentation, it certainly fits many of the mastiffs characteristics. It began as a favorite pet of the Buddhist monasteries and then made its way to Holland by the Dutch East India Trading Company. 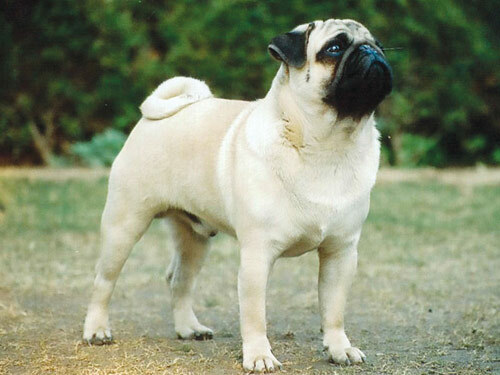 By the 1700s, the Pug could be found in France. In 1885, the Pug became an official member of the AKC and today, is renowned as a great pet and is revered on dog shows.